A giant crab eating in a dumpster. A heavily-bearded man running over hotdogs like a lumberjack running over logs. A crazy penguin dancing inside of a refrigerator. 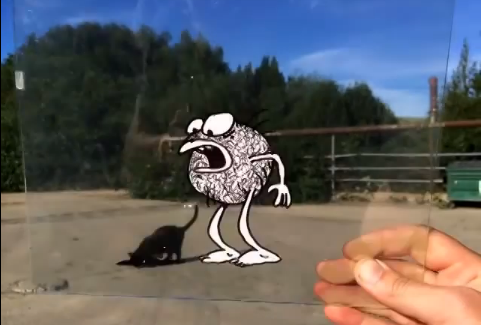 A creature spitting out a black cat. A Spongebob-like character jumping up and down on top of a stack of pancakes. These are just some of the darkly humorous scenes you'll see in Marty Cooper's series of animated work. Using an animation technique that involves traditional animation cels and an iPhone, Cooper creates short clips which combine real scenes with characters he draw and animated on the cels. The visual effect is nothing short of amazing. For more of Cooper's work, find him on Tumblr or Instagram.